We created the name organicgirl because we wanted something that had a sense of youth and promise and freshness about it. And we wanted to make real sure you know we're an organic only company. And once we chose the name, something dawned on us: Who is organicgirl? Both men and women alike who enjoy healthy, fresh, sustainable produce grown in harmony with Mother Nature. We're all organicgirls. In fact, we have it on good authority that Mother Nature is an organicgirl, too. arugula, baby green mustard, baby red mustard, cress, baby spinach, baby green bok choy, baby green chard, baby red chard, baby red bok choy, mizuna, komatsuna. ingredients may vary by season. sweet pea shoots, baby green romaine, tango, baby green oakleaf, baby greenleaf, baby green bok choy, lolla rosa. ingredients may vary by season. These days just about everyone is trying to eat healthier but sometimes salad can become kind of boring after awhile. That's why Organicgirl has just launched two new salads to add a little variety to the salad aisle. 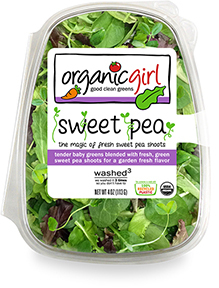 Organicgirl Sweet Pea Salad and Organicgirl Peppergreens Salad is available now and I highly recommend everyone try it! Organicgirl Sweet Pea Salad is so good! It's sweet and has a wonderful flavor and pairs well with any dressing. My family and I enjoyed this salad very much and the kids said it was their favorite salad ever. What I love most about this salad is that not one piece was bitter. This is the perfect salad for the whole family and sure to be a hit with anyone. Organicgirl Peppergreens Salad is delicious! I absolutely love it! Organicgirl Peppergreens salad pairs nicely with just about any dressing but my favorite dressing is something sweet. I feel like it goes nicely with the peppery kick that the Peppergreens have. 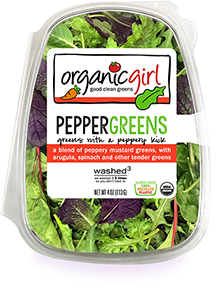 Add in a few of your favorite vegetables or fruits and enjoy a delicious Organicgirl Peppergreens salad today! Click HERE to locate a store near you that sells organicgirl! Click HERE to learn more about organicgirl! Join the organicgirl elist for coupons, recipes and all the latest news from organicgirl by clicking HERE! Follow organicgirl on social media!